Magnesium (Mg) is one of the essential nutrients in plants and animals. Mg in soil is a major nutrient reservoir for plants, and it can be absorbed into plants through root system and then into animals through food chain. Therefore, understanding the biogeochemical behavior of Mg in soil system is significant for agricultural production and human health protection. Fe-Mn nodules are common natural mineral constituents in soils. Due to their high surface/volume ratio, Fe-Mn nodules can concentrate and control the distribution and mobility of metals in soils and are thus considered to play a key role in soil environmental behavior of metals, including Mg.
To explore the mechanisms controlling the Mg isotopic compositions of Fe-Mn nodules and surrounding soil, Prof. LIU Chengshuai from the Institute of Geochemistry, Chinese Academy of Science (IGCAS), systematically investigated the Mg isotopic compositions of Fe-Mn nodules, surrounding soils, soil waters, and soil surface waters in a paddy soil profile, and stream waters, and rainwaters from south China. The results showed that the distinct Mg isotopic compositions between the Fe-Mn nodules and surrounding soils reflected the different Mg sources in their crystal structure: the Mg in the Fe-Mn nodules was mainly derived from soil waters, while that in the surrounding soils was derived from the chemical weathering of the parent granite. In addition, isotope fractionation occurred during the formation of Fe oxides because Mg2+ substitution for Fe3+ preferentially takes up heavier Mg isotopes. However, seasonally changing redox potential in soils could have caused Mg2+ ions from soil waters with light isotopes to become fixed into Fe oxides, creating bulk Fe oxides with light Mg isotopic compositions. Additionally, Ion-exchange processes can cause heavier Mg isotopes to be preferentially released into water phases during the interaction of fluids with secondary minerals. 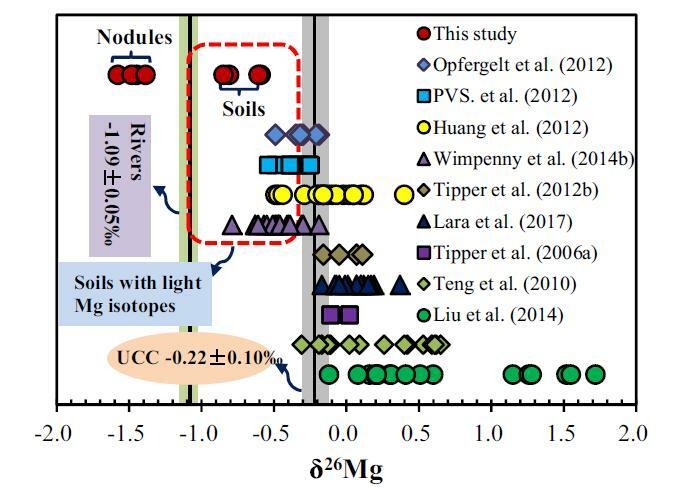 This study provides the field evidence that Mg-depleted clay minerals and Fe oxides retain light Mg isotopes and thus shift the Mg isotopic compositions of bulk soils towards lighter values. These findings are significant to explain why soils are sometimes enriched in lighter Mg isotopes relative to the parent rocks. The relevant research results titled “Contrasting Mg isotopic compositions between Fe-Mn nodules and surrounding soils: Accumulation of light Mg isotopes by Mg-depleted clay minerals and Fe oxides” were published in Geochimica et Cosmochimica Acta. The research was supported by the National Science Foundation of China and the Frontier Science Research Programme of the CAS.